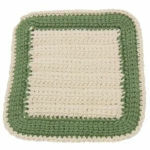 Wedding Bell Potholder -- $1.99 A Crochet pattern from Julie A Bolduc. This wedding bell potholder can be used by the servers at the reception. The pink band on it can be any color that is in the wedding. Wouldn't you rather see a pretty potholder that matches the color scheme at your reception than the old ragged holders you may see the kitchen workers using?